Instant-Band is a ready-to-use sample treatment buffer for SDS-PAGE experiments. 1. Mix Instant-Bands sample treatment buffer with a protein sample. 2. Heat the mixture and then load the treated samples to an SDS gel. 3. 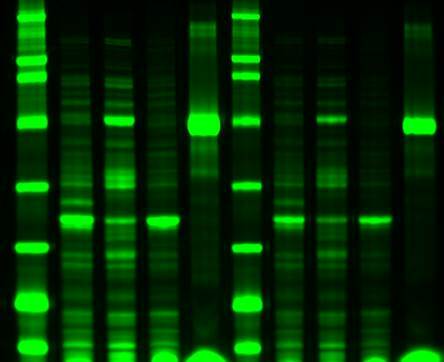 Start electrophoresis. Protein bands are instantly viewable after the run. Instant-Band treated samples are directly viewed on an UV transilluminator (1) and the same gel is then stained by Coomassie blue (2). Lane 2, 4, 6, 8 and 10 were treated by Instant-Bands loading buffer. Lane 1, 3, 5, 7 and 9 were treated by the regular loading buffer. In this image, the gel was viewed by a LED transilluminator while the gel was still in the gel cassette. 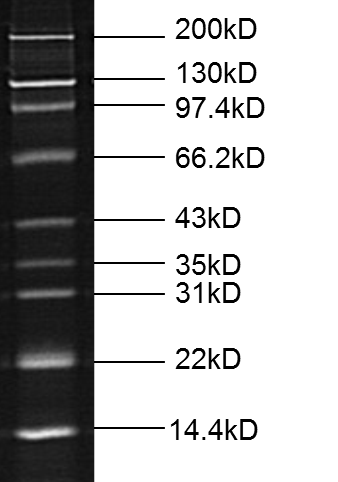 The protein bands can also be viewed by any other gel image systems. LED transilluminator is now widely available in many labs. 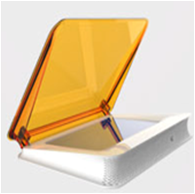 It is initially developed for Agarose gel stained by safe DNA dyes. The excitation wavelength of Instant-Band is within visible range that perfectly matches light emitted by a blue LED light. 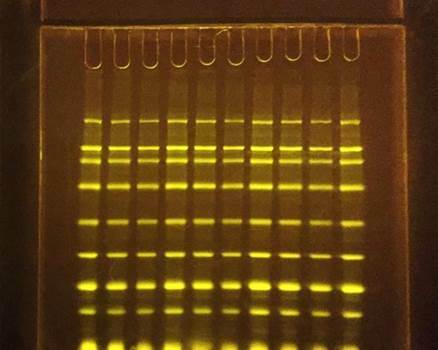 So LED transilluminator is ideally suitable to Instant-Bands stained protein SDS gel. After transferred to membrane, Instant-Bands stained protein bands become more intense because a membrane is much thinner than a gel. 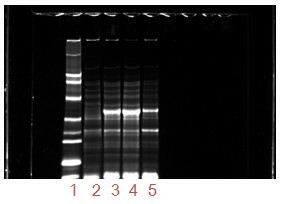 Protein samples stained by Instant-Bands can then be directly detected by Western Blot. Alternatively, you can load an Instant-Bands treated sample next to the well of the same sample treated by the regular loading buffer. 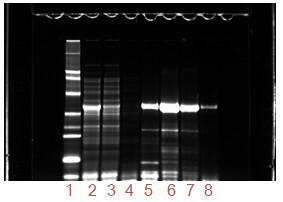 The Instant-Bands sample serves as the control for transfer efficiency and for location of the target protein. Using Instant-Bands to eliminate gel stain and de-stain, the entire process from expression to purification is streamlined without interruption. It greatly accelerates and simplifies this . The picture was directly taken while the gel was still in its cassette. It showed that the target protein was expressed and was soluble. So the experiment was immediately moved to the purification step. Instant-Bands is a 3x sample treatment buffer. It comes in various sizes. Each package contains 3 vials: Instant-Bands, Resuspension Buffer and Enhancing buffer. Enhancing Buffer is only needed for Bis-tris gel. Functionally, there are the reduced Instant-Band and the non-reduced Instant-Band, which are for reducing gel (the most common gel) and non reducing gel, respectively. 2 vials. Re-suspend each vial in 1000 ul resuspension buffer before use. 1 vial. Re-suspend each vial in 1000 ul water before use. 1 vial. Re-suspend each vial in 100 ul resuspension buffer before use. 1 vial. Re-suspend each vial in 1000 ul resuspension buffer before use. 1 vial.Re-suspend each vial in 100 ul resuspension buffer before use.